Compact and portable 360-degree LED light with carrying strap and industrial strength magnetic mount. This Personal Safety Light contains 24 ultra-bright LEDs and includes an optional use photocell. A switch inside the battery area can be set to flash day and night, or to automatically turn on at dark and off during day light. Flashes 60 Triple Flashes per minute. It runs on 2 "D" batteries. The strong magnetic base is ideal for quick mounting on vehicles, metal posts, or other metal surfaces. 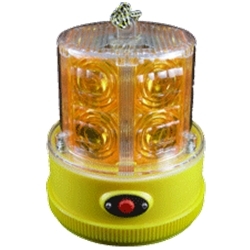 The Flashing Amber Personal Safety Light is water resistant and ideal for outdoor uses such as emergency response, construction, traffic control and other industrial applications. The Personal Safety Light with Magnetic Base is ideal for your car emergency kit. In case of a break down, this beacon will attract attention to your vehicle on the side of the road. This product is made to order. Please allow 7 to 10 business days for factory assembly. Size: 3 in. diameter by 4.5 in. tall.